Space exploration is the final frontier. Click here to play! .. Or it was. That was a few centuries, and now, the universe has been mapped out. Just because humans know where everything is, though, doesn't mean everything is in easy grasp. That's where Astronomical Mining Corporation comes in! We'd like to welcome you to the Astronomical family. Please be patient as we take you through our simple training guide to becoming a more profitable Astronomical miner. Our new interface works much like a slot machine, so you should pick up the process is no time at all. To start with, the various ores you will be mining for have been replaced with cherry symbols, BAR symbols, star spangled planet symbols, and Astronomical symbols. This is to minimize the theoretical component of this training course. Astronomical symbols mean it's your lucky day, new miner, and Astronomical will pay you a massive bonus if you get three Astronomical symbols on the payline. Thank you for joining the Astronomical Mining Corporation. 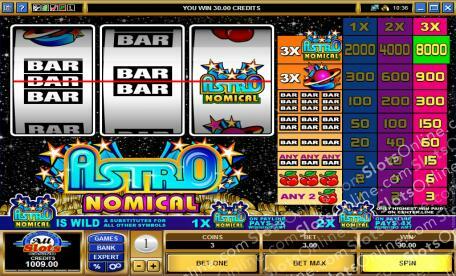 Please proceed directly to your slots based mining interface to begin your exciting career with Astronomical. Your fortune among the stars is waiting to be harvested. Astronomical symbols are wild and can substitute for any other symbol. When substituting for other symbols, the Astronomical symbol doubles the prize value.